LeDomduVin: A little introduction to Sake: the Japanese wine! Did you ever taste Sake? No? Well, not many of us have, but it is more for lack of knowledge and tasting rather than dislike. Yet, although many of us can’t really explain why, Sake has recently become some sort of phenomenon in the western world. May be, it is a manner for occidentals to quiet down their ever-active-and fast-paced life-style by finding inspiration elsewhere and discover something to bright up their monotone daily routine. Like a desperate cry to express their profound desire and aspiration to a new life style, somehow a mode of tasting and embracing the peaceful Japanese philosophy and art of living and reproducing it their own way at home. For me, up until only a few years ago, I admit that I wasn’t really acquainted with Sake. To tell you the truth, the previous store where I used to work didn’t have any. 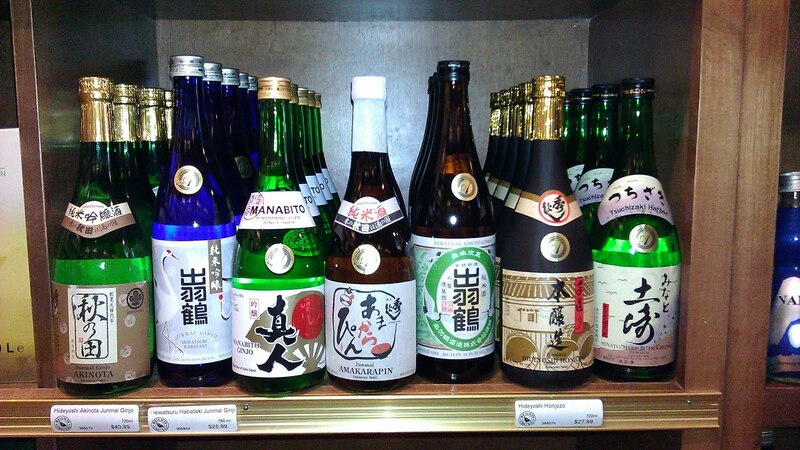 And even during my years as restaurant’s Sommelier, I rarely came across a lot of Sake(s). Most restaurants that I knew didn’t offer any until very recently. And despite the fact that it has existed for centuries, it remains a fairly undiscovered beverage for most western people. In fact, if I recall my own history with Sake, I pretty much tasted my first one about 4-5 years ago and finally realized how many types existed and how different they were only about 3 years ago. My first experience with Sake started dubitatively with a “Junmai Ginjo”, which I loved on site by the way, and since then my interest has tremendously grown in all the different styles and types. I love them all, except may be “Nigori”, because they are usually unfiltered and milky… not really my thing, (even if I buy some for my customers). Like wine, Sake has become somewhat of a growing passion for me. The more I learn about it and how it has always been part of the Japanese traditional life style and culture, the bigger my interest grows. And I’m not the only one. With the latest catastrophic climate changes, (and I’m not only talking about the weather but also the world’s mood over the last decade), mankind wants to close its eyes and continue to live without thinking of these bad times, yet it suffers from them everywhere. Therefore, it is interesting to notice the recent surge for occidental people’s inevitable attraction for the enviable research of Peace and Harmony in all element contained in Asian culture in general (Chinese’s Feng Shui, Indian and Tibetan and other form of Buddhism, Yoga, etc…). Yet lately, with the importance of restful, minimalist designs and quiet home life style to contrast with our everyday stressful routine dictated by technology and omnipresent ever-busy forced schedule, the Occident has turn its eyes on Japanese’s life style, peaceful and reenergizing interior and garden designs, Manga(s), cars, fashion, respect of Nature, ancient traditions, culture, sense of honor, respect in general, politeness, ancestral hosting abilities, tea ceremony and Sake (and more). Overall and surely for our need to look at something else than our own misery, we have come to realize how far, yet how attractive and inspiring, Japanese designs, ideology, food and culture are from the western world. Therefore, atop of reiterating Japanese interior and garden designs, we also have embraced their love for this traditional beverage made entirely with rice, yet considered by most connoisseurs and amateurs as Japanese Wine. By now, with all that has been written about it over the last few years, don’t tell me that you haven’t heard and read about Japan and its various Sake(s)! If you did that’s great and it means that somehow you welcome trends and keep an open mind, may be you also have adopted a new life style lately and incorporated some Japanese notions into it. But, if you didn’t, that is not a problem, because I will in this post briefly open your eyes on certain aspect of the Japanese world and more especially describe some of the most enjoyable Sake(s) that I bought recently. But first we need to talk a bit about Japan, few more words about Japanese philosophy, design and other facts, and a lot about one particular Sake house on which I have been focusing on with great interest since last year: Hideyoshi. Nisshoki (literally, Rising-Sun Flag) was adopted as Japan's national flag in 1870. It also is called Hinomaru (literally, Disk of the Sun) and Nihon no Kokki (Flag of Japan). The red circle represents the sun. Contemporary Japan is a secular society. Creating harmonious relations with others through reciprocity and the fulfillment of social obligations are more significant for most Japanese than an individual's relationship to a transcendent God. Harmony, order, and self-development are three of the most important values that underlie Japanese social interaction. Basic ideas about self and the nature of human society are drawn from several religious and philosophical traditions. Religious practice, too, emphasizes the maintenance of harmonious relations with others (both spiritual beings and other humans) and the fulfillment of social obligations as a member of a family and a community. You see, and this is probably why western people are so fascinated by the far Eastern world, the “Land of the rising Sun” inhabitants have believed for centuries that balance in the universe is the essence of everything, and Japanese life style and way of doing things (dressing, cooking, meditating, etc…) and decorating interior spaces and gardens truly express that concept. For example, in Japan but also in Japanese-interior-design inspired homes and apartments in general, the underlying design feature of a room or series of rooms is mostly dictated by the Japanese fixation on simplicity and approach to flowing interior design. Everything needs to be in harmony to create a practical and enjoyable living environment, rather than a place where conflicts between furniture, colors and useless, inadequate and untidy objects will render an unhealthy image of yourself and your way of living… (Ringing the bell? Might as well take another look in your house…). Furniture placement and display follows prescribed rules of fluidity. In contrast to our occidental ways of decorating a room by filling it with various and abundant objects and furniture arranged on its perimeter, creating traffic patterns crossing the center, Japanese minimalist design establishes a focal point toward the center with little obstructing free visual flow and physical movement about the perimeter, concentrating the main interest of a room to a rather unique and simplistic focal point (like a bed with barely nothing around, an arranged pattern of sofas and complementing armchairs, etc…). Another example is “doors”. Western world doors are often useless and annoying, more secure may be, when talking about doors (or windows) leading outside, but less practical and definitely less respectful of the environment and the fluidity of a room. Inside, when you open a door, you may not notice it because you are used to it and doesn’t bother you. Yet, in Japan, it usually breaks the pattern and flowing energy of the room, which is why, by tradition, Japanese doors slide on the side and often integrate the wall, opening flowingly the space and allowing harmony and energy between the rooms and/or the outside without unwanted breaks or visual annoyances. Serenity cannot be achieved where there is clutter, therefore it is important to keep the lines and appointments of these focal points cleanly defined. All things in the room must become an element in the overall scheme of the room; as it is very important that all things in life must reflect peacefulness, harmony and integrity, without hitches and other annoyances. If you come to understand Japanese minimalism, then you will learn your personal lesson how less really can mean more, and how fluidity and harmony in your home and organized, active life marked with restful and beneficial habits can bring peace to your life and way of living. Japanese home’s layout is very important but colors also are very important. Let’s take for example black and white, two often forgotten colors in our western world, yet extremely important in eastern Asian culture. When choosing strong or deep colors, don’t let them stand in the way of the architecture, structure and layout of the room; use them to emphasize an object or a piece of furniture. White and other neutrals, like off white and cream, will help you imply orderliness and cleanness, and colorful objects will suddenly come into view. Pretty distinctive and classic, yet rarely considered by most designers, when put to a good use, Black is usually defining and underlining forms and aligning structural geometry. In short, White(s) bring light, clean positive energy and the possibility to play with flowing nuances and colors. And that said, Black doesn’t clash; it defines. The most beautiful and complex things in life are usually not the most complicated or busy, they are not the ones that show everything upfront and blind your eyes, no. Beauty, respect and harmony are usually found in the images, events, sensations, emotions and moments that suggest and let your imagination take over; the things that harmoniously complete each other and flowingly complement their surroundings. Hence, nature is well made! And it is wonderfully complex, yet harmonious, and somehow, Japanese design and lifestyle tend to respect this concept and reproduce it in their home and everyday life. I could carry on for hours and many multiple paragraphs about many other Japanese things, as I read and learn about them, like: the “Geisha”, famous traditional Japanese entertainers, which have many myths about their lifestyle and history. Or even the fascinating order of the “Samurai”, once warriors in pre-industrial Japan, which are now the fierce entrepreneurs of one of the leading market in the world. But also about “Kimonos”, like the Yakuta, which represent very famous traditional Japanese clothing. I could also talk about the Japanese tea ceremony, which is a very formal event involving many exacting, methodical steps. Or yet again, about the Japanese Castles, which were the key to structure and life of many Japanese cities. And about Japanese Temples that were and still are an integral part of Japanese life and death. But I hear you say: “What about Sake?” Well, you are right, this article is about Sake, not about Japan, even if they are tightly intricate. Sake: the wine of Japan! What is Sake? Sake (pronounced Saké) is a rice-based alcoholic beverage of Japanese origin. It is sometimes spelled Saké to show the pronunciation more clearly. This beverage is called sake in English, but in Japanese, sake (酒) or o-sake (お酒) refers to alcoholic drinks in general. The Japanese term for this specific beverage is “Nihonshu” (日本酒), meaning "Japanese sake". Sake is also referred to in English as a form of rice wine. However, unlike true wine, in which alcohol is produced by fermenting the sugar naturally present in fruit, sake is made through a brewing process more like that of beer. To make beer or sake, the sugar needed to produce alcohol must first be converted from starch. But the brewing process for sake differs from beer brewing as well, notably in that for beer, the conversion of starch to sugar and sugar to alcohol occurs in two discrete steps, but with sake they occur simultaneously. Additionally, alcohol content also differs between sake, wine, and beer. Wine generally contains 9–16% alcohol and most beer is 3–9%, whereas undiluted sake is 18–20% alcohol, although this is often lowered to around 15% by diluting the sake with water prior to bottling. Rice: The rice used for brewing sake is called “Shuzo Kotekimai” (sake rice). The grain is larger, stronger, and contains less protein and lipid than ordinary rice eaten by Japanese. The rice has a starch component called “Shinpaku” in the center of the grains. Since sake made from rice containing purely starch has a superior taste, the rice is polished to remove the bran. If a grain is small or weak, it will break in the process of polishing. This rice is only used for making sake because it is unpalatable for eating; it is clearly distinguished from rice for the latter purpose. There were at least 80 types of sake rice in Japan. Among these, “Yamadanishiki”, “Gohyakumangoku”, “Miyamanishiki” and “Omachi” rice are very popular. Water: Water is the one of the important ingredients for making sake. Rigid restrictions are observed for the concentrations of certain chemical substances, which can affect the taste and quality of sake. The water used is almost always groundwater or well water. Urban breweries usually import water from other areas, because of the difficulty of getting water of sufficient quality locally. I took the above information, courtesy of Wikipedia, as an introduction for the subject of Sake, yet I will not fool you by pretending that my knowledge of Sake is that sharp. No, I’m still learning and quickly developing my palate, to better understand, comprehend and appreciate this delectable beverage. Last year for the first time and this year again, at the beginning of February 2011, Linda Noel Kawabata, a Certified Advanced Sake Specialist and USA Brand Manager for “Akita Sake Promotion and Export Council” (ASPEC), came to visit me with one of the most eminent Japanese Sake brewery owner, Mr. Naoki Suzuki. During these two visits, I tasted some of the most beautiful Sake(s) that I ever tasted in my life until now. Consequently, that is how Mr. Suzuki and Suzuki Shuzouten Brewery Hideyoshi Brand, which is the full name of his brewery, became, to my palate, synonyms of utmost quality in term of Sake standard. ASPEC: Akita Sake Promotion and Export Council (ASPEC) is a new consortium of 5 dynamic, traditional, award-wining, progressive, sake breweries from Akita Prefecture, in northern Japan. The Akita Prefecture is located in the Tohoku region of northern Japan. Its capital city by the eponymous name, Akita, is 280 miles north east of Tokyo. The prefecture is 130miles from north to south and 70 miles from east to west. Within that triangular shape lies 4 mountain ranges: the world heritage Shirakami-Sanchi mountains to the north; the Ou Mountains which form the eastern border, Running parallel to the Our mountain range is the taller Dewa Mountain range that runs through the center of the prefecture. To the south is the eternally snow capped Mount Choukai, also know as the Mt Fuji of Akita. Akita’s western border is on the rough coast of the Japan Sea. ASPEC members have their breweries in these mountains, valleys and seacoast. And as their sake were mostly consumed by local people and produced to pair with the local cuisine, you can clearly identify the nuances of each brewery, as you taste through the portfolio. Founded between 1689 and 1874, for centuries Hinomaru Jozo, Suzuki Shuzouten, Akita Seishu, Tenju and Ginrin Brewery, have produced a superlative selection of hand made, artisanal sake. The Japanese cherish the region of Akita for its natural beauty, lively festivals, delicate handicrafts, restorative hot springs, delicious seasonal foods and SAKE! Ranking fourth in total sake production, Akita is one of Japan’s most important sake producing states. The Akita Cold Brewing method was developed in this state that is blanketed in snow throughout the long winter months. In the awe inspiring beauty of the winter white landscape is hidden the secret of Akita Sake—the purest underground soft water sources –fertile soil and a dust free, pristine environment for producing sake. The wisdom of hundreds of years of sake brewing in the region is collectively referred to as the “sannai” school of brewing. The Sake Brewing Masters, known as “toji,” harness the severe elements of the region, partnering with nature to create sake that is the distilled essence of the nature that surrounds them. The Akita Cold Brewing Method ensures smooth, clean sake with full body and memorable characteristics. The people of Akita are so proud of their sake that they refer to their region as “bishuoukoku ” The Empire of beautiful sake! Suzuki Shuzouten is one of the oldest, continually operating Sake houses in Japan. It is Akita’s most well-known and respected Sake brewery. Founded by Matsuemon Suzuki in 1689, the current owner, Mr. Naoki Suzuki, is the 19th heir. The local lord Satake bestowed the name Hideyoshi on the brewery over 300 years ago. It is said that he tasted all of the Sake in Akita and judged the Sake of this particular brewery to be the very best. To officiate that he had found Sake of superior excellence, the local Lord conferred, to the brewery, the name “Hide” (excellence) and “Yoshi” (goodness), which is also the name of the legendary feudal warlord Toyotomi Hideyoshi. Suzuki Shuzouten has lived up to that declaration of superior excellence for 300 continuous years. Producing excellent, award winning sake generation after generation is no small task. Fortunately, the Senboku region of Akita where the brewery is located has the perfect combination of natural elements necessary to produce high grade Sake. It has very fertile soil and is one of the leading rice-growing regions of Japan. The area is all the more special because of it so successfully produces the highest quality Sake rice, which is a taller, heavier and more difficult grain to grow, and by the way rather unpalatable. Secondly, the area has pure, fresh, medium-hard, water source from the nearby Ou Mountain. From cavernous underground springs water is pumped up to a 40-meters deep well within the Suzuki Shuzouten compound. The severe winter cold is the third major ingredient. Harmonizing with nature smooth, full bodied, satisfying taste. While they take advantage of all that nature supplies, and are committed to traditional brewing methods, Hideyoshi continues to challenge itself, believing in continuous innovation. Hideyoshi developed a new strain of sake rice as well as the region’s first Junmai yeast. Picture of Linda Noel Kawabata and Mr. Naoki Suzuki, owner of Suzuki Shuzouten Brewery - Hideyoshi Brand, next to the Sake section at Heights Chateau. 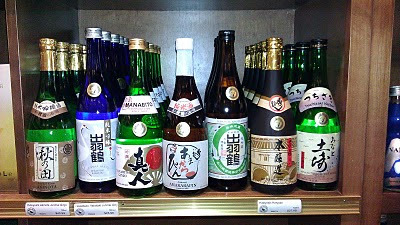 Section that I just revamped with 6 of Hideyoshi Sake and 15 other labels from a few selected brands. I would love to have more on the shelves, but somehow demand is still fairly low and I prefer to have a small selection of carefully selected high quality Sake that will sell, rather than have too many of Ok quality Sake that will not move from the shelves. Once presentations were done, we lengthily talked about the process of making Sake and how the percentage of external part rubbed off (polished off) the grain of rice to obtain the purest core and consequently starch, is very important. We tasted the following Sake under Linda’s knowledgeable explanations and translations of the detailed comments from Mr. Suzuki. I can say that, like often with wine and their winemaker, the various Sake(s) (that we tasted) reflected the kindness, politeness, complexity, generosity and bonhomie emanating from Mr. Suzuki, a man of extreme focus and gentleness, with a good sense of humor and friendly manners that makes you feel comfortable from the start and let you think that you’ve known him forever. Whether from Hideyoshi or the other brands of ASPEC, all the Sake are coming from the Akita region, northern Japan, and, as we will have done for wines, we tasted them from the lightest to the heaviest, or more elegantly, from the friendliest to the most complex. The following are the Sake that I tasted with the team during the latest tasting with Linda and Mr. Suzuki; yet I will soon complete them with the descriptions of the ones from the first visit, which where mostly from Hideyoshi and were all fantastic and highly recommended. Hinomaru Brewery was made “the truest of the true” Sake since it was funded by Kutsuzawa Jinbei in 1689 in Yokote townin the southern part of Akita prefecture. A snowy region of northwestern Japan, Yokote is nestled in an agricultural belt long known for its fertile land and superior rice production. 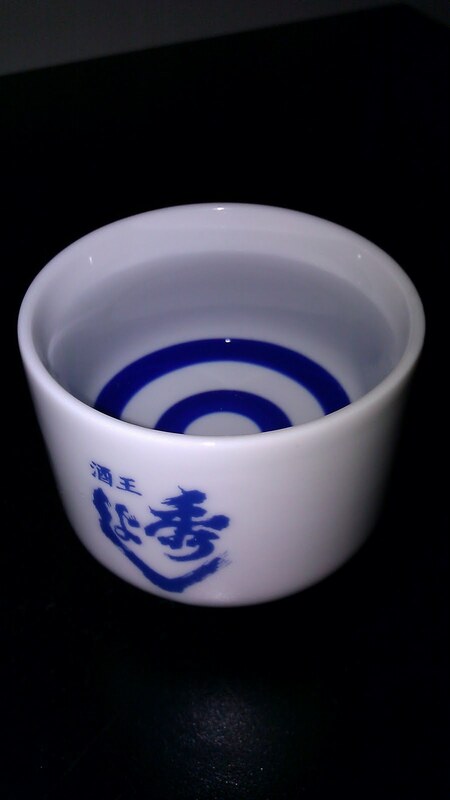 Hinomaru Manabito Ginjo Sake has a clean, clear, transparent color. The nose boasts beautiful, fresh, fruity aromas of peach and citrus and white stone fruit and minerals. The palate is soft, fruity with flavors of melon fruit, honeydew and freshly cut melon peel. Despite slight green edges, which bring ever more freshness to the overall taste, this Sake is light, bright, focus, very balanced and extremely approachable, on the fruit side without being sweet. Litchi and melon are the primary fruit. Excellent and highly recommended for everybody and all occasions! Served chilled as an aperitif with "hors d’oeuvres". Jushiro Ito founded Akita Seishu Dewatsuru in 1865, in a 150-yearold thatched roof estate that was built at the end of the Edo period in Daisen City, in Akita. Beside its clean and clear color, Dewatsuru Habataki Junmai Gingo Sake offers a dry, slightly restraint, lightly meaty (bacony may be) nose with hints of Vanilla beans and floral, herbal notes (hay, chamomile), slightly farmy. The palate is fairly light, and dry, a touch fuller than previous one with earthy, meaty, nutty flavors resembling of meat fat and egg corn. Balanced and food friendly, this is a lovely Sake need to be served chilled or room temperature with starters like green and / or vegetable salad and charcuterie. Well crafted. Behind its clean and clear color, Dewatsuru Kimoto Junmai Sake develops expressive meaty and farmy aromas, more than the previous one, with intermingled notes of meat fat, grilled bread, starch, hay, farina, and slightly roasted, earthy notes. The palate is quite full, earthy with great balance, focus and same yet stronger flavors as the nose, offering a medley of nuances between meat, toasted, roasted, grilled bread, meat fat, mushroom and cereals. Excellent with food, this earthier Sake will be great with Spanish food: Jamon Iberico and Paella de Pollo y Mariscos. Excellent, definitely recommended. As one of my favorite Japanese Brewery, it was a pleasure to once again taste Sake from Hideyoshi, after discovering them for the first time last year. Hideyoshi Honjozo is considered as the father of Honjozo Sake. The depth and complexity of this Honjozo express the true potential of the classification. Honjozo means “Spiritual Balance” and is a Sake which was cut with spirit/ alcohol during the brewing process. Hideyoshi Honjozo Sake nose offers rustic, earthy flavors of rye and oats, and here again, a lot of meaty, nutty, roasted nuts, grilled toast, mushroom, forest floor, and tertiary aromas. It is rich, clean, fruity and nutty on the palate, with flavors of date fruit, stone core dried fruit and lot of mineral, with a wonderful, long finish. So far it the strongest Sake of the bunch, it is excellent too and seems that it was made exclusively to be paired with earthy, substantial food. It pairs well with grilled meats and hearty soups. Love it, highly recommended. Naba Shouten (Ginrin Brand) is a company that was successfully selling merchandise to the ruling feudal clan of Akita, when in 1815, the leader of the clan, Satake Yoshikazu, ordered Yusei Saburouemon to make an experimental sake brewery. One hundred and thirteen years later, in 1928, under the direction of Akita Prefecture Brewing Research Center, Mr. Masatsune Hanaoka, Naba Shouten built the first reinforced concrete Sake brewery in Tohoku, the Northeastern region of Japan. The brewery, located right at the Sea of Japan, is called Ginrin Brewery. Traditions meet trendy at Ginrin Brewery where they revitalized the ancient Yamahai Sake brewing method within a modern concrete structure. The name “GINRIN” is in honor of the sake-loving fishermen in the port town. The Sea of Japan is known for its rough waters and the valor of the local fishermen. In the traditional song, “Soranbushi”, the fishermen celebrate a bountiful haul while enjoying sake and singing: “The fish glisten silver, the seagulls swirl, the sun shines well upon us!”. “Yamahai” is the term given to Sake where lactic acid is allowed to develop spontaneously in the early, “moto” yeast fermentation stage of Sake production. Allowing this naturally occurring process requires great skill and patience from “Toji” (master Sake brewer), Mr. Katsuhiro Fujita, because more wild yeast and bacteria purposely become part of the brew. The flavor profiles that result are wonderfully rich and tangy and invite a host of delectable food pairings. With a clean and clear color, Minato Harbor Tsuchizaki Yamahai Nama Genshu: Futsu Sake, undiluted and unpasteurized, offers richness and freshness at the same time. The nose offers very expressive aromas of nutty, dried fruit, date, apricot, melon peel, litchi, dry chamomile flowers, white blossom and nuances of freshly cut hay. The palate is beautifully balanced and inviting, with excellent texture and deep, concentrated flavors yet it is elegant and refine. I love it. Serve it chilled or room temperature over fish in sauce, shellfish and white meat dishes. Beautiful and highly recommended. To resume, I will say that I overused the word “excellent” for all the above Sake and in general for all Sake from Hideyoshi, but it is true, despite my learning novice palate in term of Sake, my sharp and discriminating palate in term of wine is assuring me that I’m not wrong about my feeling and sensations regarding these Sake. My taste buds definitely agree too and are asking for more. I’m urging you to embrace the world of Sake and discover the extremely diversified types and flavors that they have to offer and that are available at your local store or online. You will never insist enough about the fact that you should go to www.HeightsChateau.com to find out about all the Sake that I bought lately, as well as all the wines too. We have a "What's New" rubric that we update weekly. 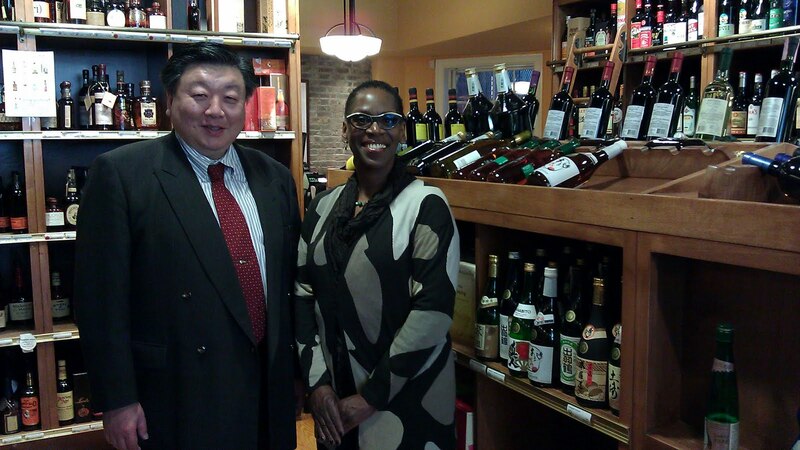 You can also go to http://www.sakayanyc.com and visit the site of the only Sake specialized boutique store in Manhattan. Or even consult http://www.urbansake.com, which is a great Sake website. I hope, as usual, that this post, even if extremely long, was informative and gave you the desire to discover Sake. Promises, I will soon find my notes that I misplaced about the first visit of Linda and Mr. Suzuki and post them ASAP. Info about the wineries taken and edited from the "ASPEC" brochure left at the store by Linda, and also from the ASPEC website at www.aspec-sake.com and certain details from our conversation with Mr.Suzuki. Part of the other info courtesy of www.Wikipedia.com and other inspiring references in books and related articles about Japan read within the last few years.